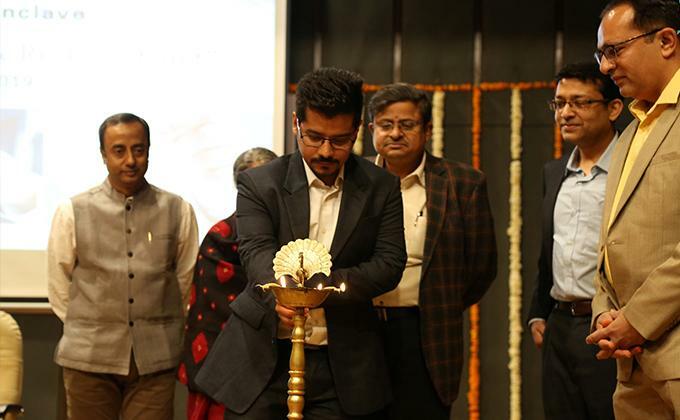 Pratidhwani, the 6th Alumni Conclave, was organized by the Institute of Management, Nirma University (IMNU). Alumni of the institute with relevant work experience in the fields of IT & Consulting, Finance, Entrepreneurship, Marketing, HR & Operations formed panels, and addressed the audience on various topics. The Conclave began with the IT & Consulting Panel, with Mr. Maneesh Sharma (MBA-FT 2002-04), Senior Solution Manager, IBM India Pvt Ltd and Mr. Chintan Mehta (MBA-FT 1998-2000), Associate Director, KPMG India addressing the audience. Mr. Sharma discussed how new age technology changes are acting as destructors to existing business models, and how AI in India is set to expand as digital and data sense continue to evolve. He discussed the impact of the same with respect to the automotive, healthcare & life sciences industries, as well as public sector services. The panel moved on to discussing how in India, AI has been leveraged largely for predictive data analysis by E-commerce companies, government & aviation. Streaming & accelerating the process to deliver contextually accurate insights is now possible, and the ability to generate robust insights which were not possible earlier drives disruptive business models like Manipal Hospitals. The panel ended with a discussion on different points of adoption for different companies in the implementation and impact of emerging technologies. The Finance Panel consisted of Mr. Rituraj Saxena (MBA-FT 2002-04) Executive Vice President, Yes Bank Ltd. He talked about why companies embrace the path of destruction and re-creation and to what extent they do so. It is generally done by companies that wish to stay ahead of the curve, willing to do away with their older processes for the satisfaction of customers. He discussed the era of new age banking which includes instant account opening, account usage, commercial banking, loan application, international trade transactions, transaction processing, money transfer, international remittances, customer interaction, regulatory & compliances. He also talked about the various personalities an individual leading a team can be- Visionary, Creator, Manager, Destroyer, and the stages at which they are all important in their own right. The Entrepreneurship Panel discussion was kicked off by Mr. Siddhant Tawarawala (MBA-FB 2015-17) Founder & CEO, Wide Need Pvt Ltd. According to him entrepreneurship is a lonely journey, it is necessary to be fearless. He talked about his product- Peeschute, a unisexual urine packet for when access to a washroom is difficult. He started a blue ocean strategy workshop in the campus of Nirma University. Discussing how an idea is turned into a venture, he said that the basics of a good office are a good team, difference in validation and assumption, product market fit, having a business model, mentoring and networking, raising funds, and building customers. Mentioning that valuation figures are the goldmine for start-ups, he said that continuous innovation is extremely important for sustainability. He ended his discussion by advising the students to follow Shark Tank, which is a great resource for aspiring entrepreneurs. The next speaker of the Entrepreneurship Panel, Mr. Raj Joisar (MBA-FB 2013-15) Vishal Engineers & Galvanizers Pvt Ltd, mentioned that following their passion is the least important thing for an entrepreneur. Entrepreneurs need to be perseverant, as not everything can be learnt externally. It is important that they start small, be consistent, know one’s strengths, build a good team and be open to corrections. It is also important to stay updated in the current scenario, as change is the only constant. 85% of the working professionals of India want to start a start-up, and 76% of the Indian workforce want to work with a start-up. Towards the end, he talked about the differences between being an entrepreneur and running a family business. He said that students with family businesses could also involve themselves in the process of intrapreneurship in their existing businesses. The third speaker of the panel was Ms. Shikha Shah (IMBA 2013-18) Founder, Fibre Labs & Co-Founder, Brew Sight LLP. She discussed the 3 bases of disruption- new creation, effective replacement, and a new way of doing something. She talked about Fibre Labs, which focused on increasing agricultural output to improve sustainability and productivity for farmers. She focused on the start-up in spite of getting the best offer in her class in her graduation. She said that for starting a business, it is important to know within whether you see yourself working on your own idea. For the Marketing Panel, Mr. Debjyoti Sinha (MBA-FT 2003-05), Group Manager- International Business, Royal Enfield was invited. He started the session by advising the students to challenge status quos, and to ensure that we don’t just follow what has always been done. It is important that instead of developing a wide knowledge base, the industry now demands employees who understand the intricacies of one topic. The HR Panel consisted of Ms. Prerrna P Kapoor (MBA-FT 2006-08) Director, Proeves, Mr. Rathin Sengupta (MBA-PT 1999-02) Head of Personnel- Physical Research Laboratory) & Mr. Hemant Nitsure (MBA-FT 2004-06) Founder & CEO, Directus HR Services. The Operations Panel consisted of Nishith Modi (MBA-FT 1998-2000) Director, Ronson Group, & Tinu Sukhadia (MBA-FT 1996-98) CEO, Inverion Technologies Pvt Ltd.